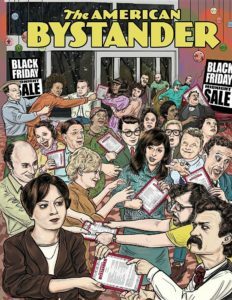 The American Bystander magazine is a print-only humor magazine, and while that may seem like an anachronism in this day and age, editor Michael Gerber joins the show to talk about why it’s the perfect vehicle for humor. I’ve been a fan of the Bystander since its (re-)inception in 2016, and it was a delight to talk with Michael about the magazine’s history, his background as “the world’s only expert on print humor magazines”, the decision to crowdfund the magazine and how it beats the days when “paper bag money” was necessary to get a magazine on the newsstand. We get into how he keeps the rhythm of the magazine flowing between prose pieces, gag panels, strips and other pieces, as well as the contributors who passed away before he could get them into The American Bystander, the ones he’s vowed to get, and the challenges of getting diverse voices in the magazine. We also discuss his vision for America, the politicization of history, the experience of reading National Lampoon when he was 4 years old, and finding his life’s purpose in trying to start a cult. Give it a listen! And go subscribe to The American Bystander fer chrissakes!! Also, you should check out this BoingBoing article on how a printer refused to print the newest ish because “Christian owners” wanted to protect “the kids”, and this secret video of Operation Waterfall that Bystander staff smuggled out of Russia! Michael Gerber is Editor and Publisher of The American Bystander, the all-star comedy quarterly. Called “the world’s only expert on print humor magazines,” Gerber has spent 30 years as a comedy writer, editor, art director and magazine consultant. His work has appeared in The New Yorker, The New York Times, SNL, and many other venues; his novels have sold 1.25 million copies in 25 languages. In 2003, Barry Trotter and the Shameless Parody fried the brains of a generation of English teens, and now we have Brexit. Sorry. Credits: This episode’s music is Fella by Hal Mayforth, used with permission from the artist. The conversation was recorded at the Santa Monica Public Library on a pair of Blue enCORE 200 Microphones feeding into a Zoom H5 digital recorder. I recorded the intro and outro on a Heil PR-40 Dynamic Studio Recording Microphone feeding into a Cloudlifter CL-1 and a Mackie Onyx Blackjack 2×2 USB Recording Interface . All processing and editing done in Adobe Audition CC . Photo of Michael by someone else. It’s not on my instagram.